January may have lasted forever, but February was over in the blink of an eye. This month was about settling into the normalcy of life in Atlanta once again. I saw several of the Oscar-nominated movies, went to the opening weekend of Black Panther, and did a lot of cooking. Life isn’t very glamorous these days, as the video above will attest, but I know it’s still where I’m supposed to be. For Lent this year, I gave up social media and alcohol. I haven't talked about it much since you're not exactly supposed to showcase your fast. I didn't grow up observing Lent, but it has become an important part of my year as I prepare for Easter. I've found that I miss the full glory of Easter if I skip over the long season of Jesus preparing to make his way to the cross, and all the sacrifices he made to go there. My fasts this season are from the things that fill the emptiness in my life. Don't want to think about the sadness in my life? A glass of wine will go great with dinner. Want to just numb out? An hour of instagram scrolling will do that. I've been celebrating Feast Days on Sundays, so that's why you see me posting occasionally. It's definitely been a challenge, but as the weeks go on, it gets easier and easier. I'm taking a class called Death, Dying, & Grief (such a seminary class!) and we began by reading this book. It's a heartbreaking account of the migrant crisis on the Arizona border. The book was published 8 years ago, so it filled me with rage to know how these deeply broken systems have only gotten worse. Build a wall? We already have one and it doesn’t work. This book is tough but I can’t recommend it enough. I was looking for a Lenten devotional for this year and one of my professors introduced me to th Resipiscence Devotional. It’s a devotional focused on dismantling white supremacy during the season of Lent. It’s a topic I’ve spent most of the last few years thinking about white supremacy and I’m grateful for a tool to tie it into my own meditative faith practices. I am so obsessed with this soup that I have made the full recipe twice, just for myself. It’s really easy to make (I use canned beans instead of dried), easy to reheat, and so delicious. I also learned how to make homemade vegetable broth from my scraps, which is even better than making it directly into compost. This meal ends up being really affordable, on top of its deliciousness! If you aren't watching The Good Place right now, what are you even doing with your life? I love The Good Place so much that as soon as the season ended earlier this month, I rewatched both seasons all over again (I had to make 3 free NBC App accounts, but it was worth it!). It’s got some fantastic twists that I don’t want to spoil, but let me just say- it gets better and better. I learned about this podcast from a coworker a few years ago and have listened to it on and off. Lately, I've been listening to it most mornings andhave really been enjoying it. It’s a nice 10-13 minute long guided meditation and it’s easy to listen to on my morning walk or while I’m getting ready. Winter is apparently over in the South and we've had highs in the upper 70's all week so we started working on our community garden. 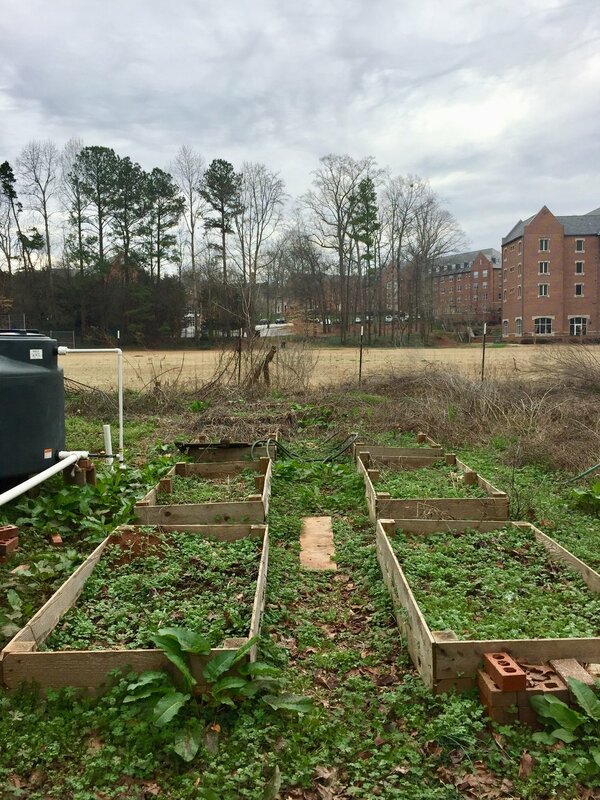 The garden (and sustainability in general at CTS) has been a longtime challenge but there's a small and committed group who are working toward a more sustainable environment here at Columbia. The pictures above bring me so much joy because they represent the beginning of the next planting season. Gardening is such a spiritual practice for me and it's such a joy to get my hands dirty. I have been following the impended end of DACA with great frustration and fear. A few weeks ago, I got a group of students together to talk about what we could do at Columbia to stand in solidarity with DREAMers. Together, we organized calls to our Senators, wrote an op-ed for the Atlanta Journal Constitution, and planned a rally in downtown Decatur. We had around 30-40 faculty, staff, and students who came out on a weeknight to hold space for the DREAMers, to pass out flyers about how to contact Congress, to live our our faith in the public square, and to encourage others to do their part. It may have been a drop in the bucket, but it was a drop nonetheless.